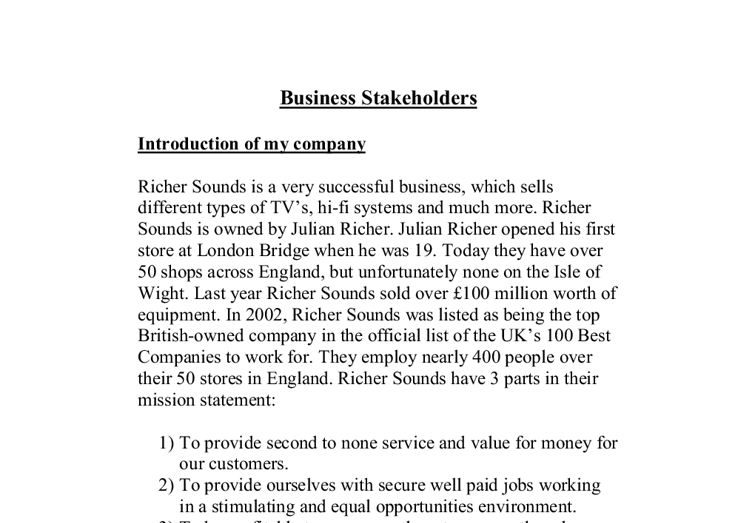 Business Stakeholders Introduction of my company Richer Sounds is a very successful business, which sells different types of TV's, hi-fi systems and much more. Richer Sounds is owned by Julian Richer. Julian Richer opened his first store at London Bridge when he was 19. Today they have over 50 shops across England, but unfortunately none on the Isle of Wight. Last year Richer Sounds sold over �100 million worth of equipment. In 2002, Richer Sounds was listed as being the top British-owned company in the official list of the UK's 100 Best Companies to work for. They employ nearly 400 people over their 50 stores in England. Richer Sounds have 3 parts in their mission statement: 1) To provide second to none service and value for money for our customers. 2) To provide ourselves with secure well paid jobs working in a stimulating and equal opportunities environment. 3) To be profitable to ensure our long term growth and survival. These are good mission statements for 3 reasons: if the company does not give value for money to the customers then they will lose profit. An equal opportunities environment is good for morale of the workers because they do not have to feel not as important as other employees. It is good that Richer Sounds are considering their long-term growth and survival because it shows that are being careful about their business not just rushing into spending big money on products they may not sell. ...read more. They can concentrate on keeping their prices competitive for the customers and paying good salaries to the colleagues - rather than allocating part of their profits for external shareholders. 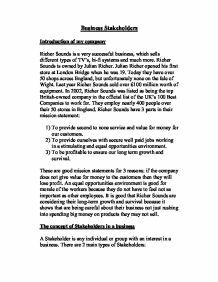 Richer Sounds' Suppliers: Richer Sounds Purchasing department would consider this its key group of stakeholders. Without suppliers they would not be able to obtain the stock they sell to their customers. Purchasing is responsible for forming and keeping good relationships with their suppliers and they communicate with their suppliers every day. Richer Sounds' Third-Party Distribution Company: This company is called Two-Way. It operates the warehouse we use. Two-Way drivers also distribute stock from the warehouse to the stores. The fact that we have a close relationship with Two-Way and use one organisation to do this work has benefits for both Richer Sounds and for Two-Way. Richer Sound' Financier: Richer Sounds main financier is their bank. They have a bank overdraft and also have bank loans, which are listed in their business accounts. Over the years they have developed a close relationship with their bank manager. This is important. It is always helpful if a bank manager understands how a business operates and the type of problems or difficulties which might occur - and why. The bank is also far more likely to support a business during any difficult times if it is confident that the business is financially sound and well run. ...read more. it has in place a number of strategies designed to satisfy the disgruntled customer, reimburse any financial loss that they may have incurred and persuade them to remain loyal to the business. Suppliers and the business: Suppliers are often quoted as complaining about the lack of prompt payments from businesses for deliveries of raw materials, and if this became a regular problem then the suppliers may well refuse credit to the businesses or may even cease all dealings with them. On the other hand, many businesses have been known to complain about the late deliveries of raw materials and components from suppliers, and the dubious quality of the parts once they have been inspected. The community and the business: As outlined previously, the local community can often suffer at the hands of a large company through the negative externalities of pollution, noise, congestion and the building of new factories in areas of outstanding beauty. However, if the business faces strong protests from residents and from pressure groups concerned about its actions, then it may decide to relocate to another area, causing much unemployment and a fall in investment in the community it leaves behind. Richer Sounds Conflicting Interests Customers and the Business: The customers of Richer Sounds and the actual company will have conflicting interests because the business is looking to put prices up all the time, and if they do this the customers will not be happy and might shop somewhere else, therefore Richer Sounds lose profit anyway. ...read more. How Co-op implements quality control in the production process: Co-op carries out its quality control by simply extracting samples of a certain size from the ongoing production process. They are then produced in line charts of the variability in those samples, and considered by their closeness to target specifications. check the people are working and producing the quality goods, plus the inspector can effete the finance department because the inspector are just reducing the amount of money of the business by just checking people are working to quality standards. These may be prepared on paper and scanned into a computer, or created on computer using a CAD or graphics package. Any type of graphic stored on computer can be viewed on screen or attached to an email. So Tesco could use graphical communication to create posters. Identify the stakeholders you feel will have an interest in the business. If Coca Cola is doing well the employees would usually be rewarded with either bonuses, pay rises or an increase in holidays. If Coca Cola is losing money and cant keep paying wages. Some employees might need to be fired and replaced by machinery. Employees would have to also explain what people are consuming and influence people to buy different things from McDonalds. They have to build a polite relationship with consumers. Employees play an important role with the customer itself, they should persuade the customer to buy their products or use their service. Analysis of The Cadbury company. materials and Labour so that the finished product can meet customer needs. The output could either be a service or a product (in Cadbury's case). The business will need to have a system to ensure that the production process and the product itself are of constant high quality production.